Department of Mechanical and Industrial Engineering, Sultan Qaboos University, Muscat, Oman. 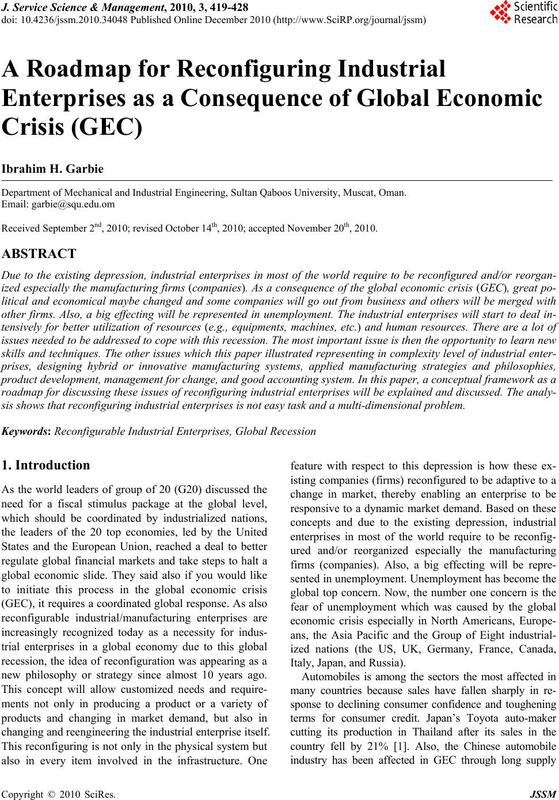 Received September 2nd, 2010; revised October 14th, 2010; accepted November 20th, 2010.
sis shows that reconfiguring industrial enterprises is not easy task and a multi-dimen sional problem. new philosophy or strategy since almost 10 years ago. changing and reengineering the industrial enterprise itself. facturers are reporting massive double digit sales drops. combinations of stronger and weaker banks  . unemployment is also rising, albeit at a slower pace. and new organizational structures, etc. oduces a framework of how to deal with this crisis. ture work will be introduced in Section 5.
and customers passing through all m anagement levels . 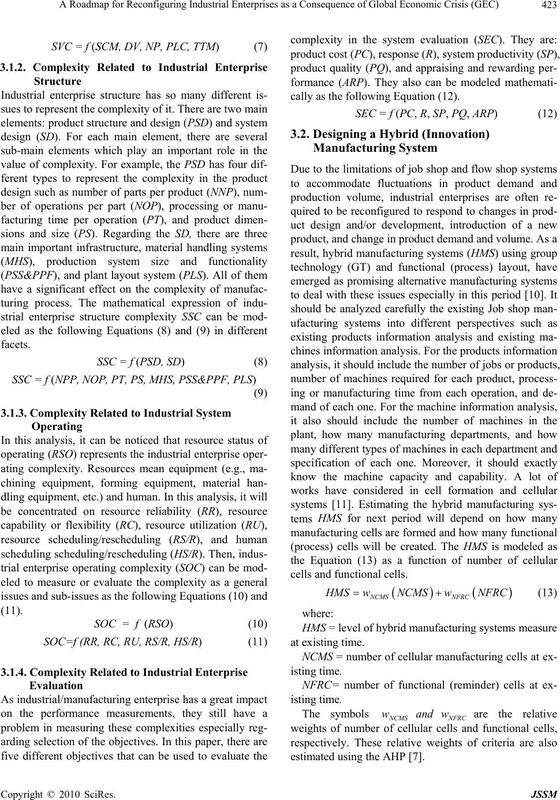 Hybrid (or innovative) Manufacturing Systems (HMS). at least one or more functional cells as reminder cells. sition from a boss period to a leader period. Figure 1. 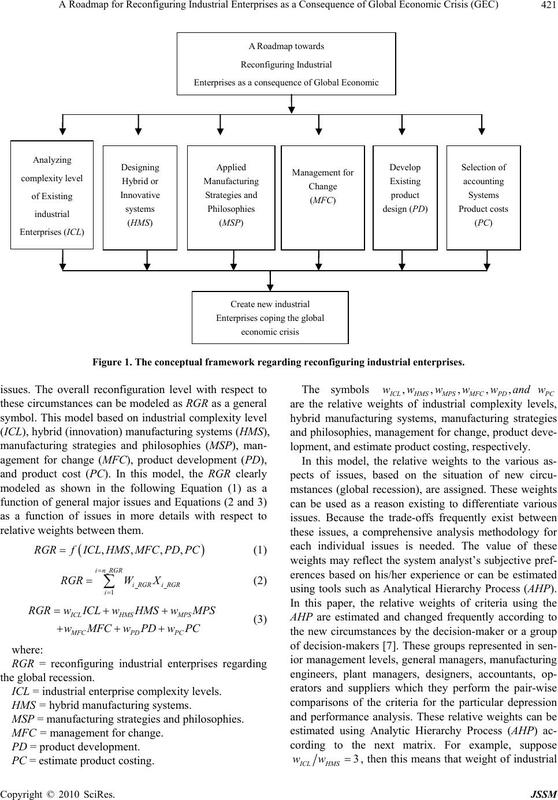 The conceptual framework reg arding reconfiguring industrial enter pri se s.
ICL = industrial enterprise complexity levels. HMS = hybrid manufact uring systems. MSP = manufacturing strategies and philosophies. MFC = management for change. 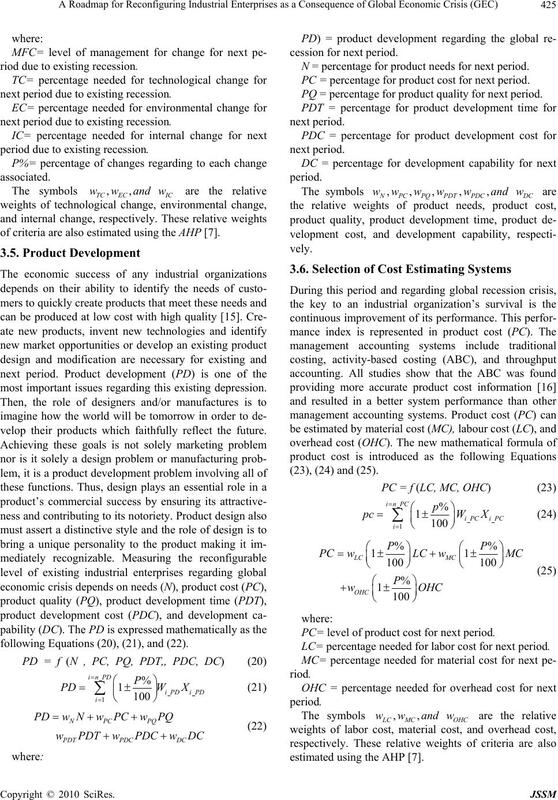 PC = estimate product costing. lopment, and estimate produ ct costing, respectively. using tools such as Analytical Hierarchy Process (AHP). than hybrid manufacturing systems (HMS). include different issues which are mentioned in Section 2.
level (ICL) is a function of several important issues. 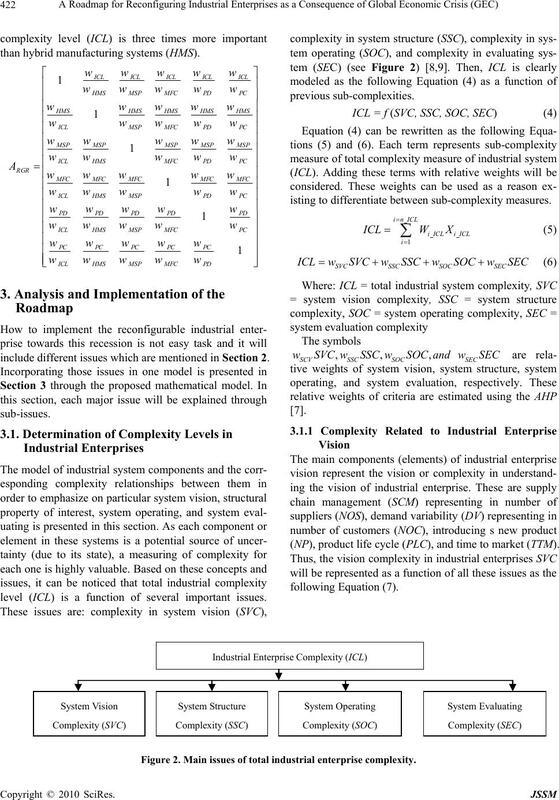 isting to differentiate between sub-complexity measures. (NP), product life cycle (PLC), and time to market (TTM). Figure 2. 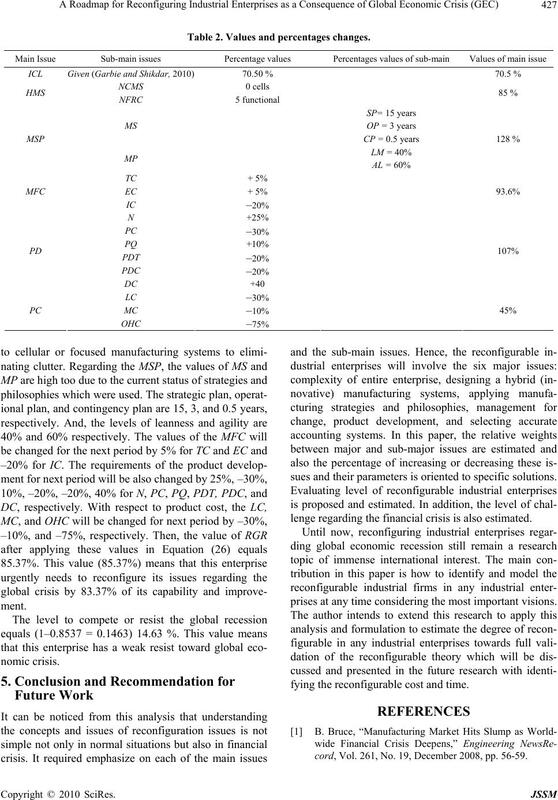 Main issues of total industrial enterprise complexity. cally as the following Equation (12). estimated using the AHP . ine relationships, machine loading and sequencing, etc. tions (14), (15) and (16). SP = strategic plan at existing time. OP= operational and tactical plan at existing time. CP= contingency plan at existing time. of criteria are also estimated using the AHP . clude such things as new equipment and new processes. industrial enterprises to feel threatened. to the following Equations (17), (18) and (19). riod due to existing recession. next period due to existing recession. period due to existing recession. most important issues regarding this existing depression. velop their products which faithfully reflect the future. following Equations (20), (21), and (22). N = percentage for product needs for next period. PC = percentage fo r p r o duct co st fo r next p e ri o d.
PQ = percentage for product quality for next period. (23), (24) and ( 25 ). PC= level of product cost for next period. LC= percentage needed for labor cost for next period. relative weights between the main and sub-main issues. to be eliminated or at least reduced in the next time. ber of functional departments and it must be converted. Table 1. Relative weights between main and sub-main issues. Table 2. 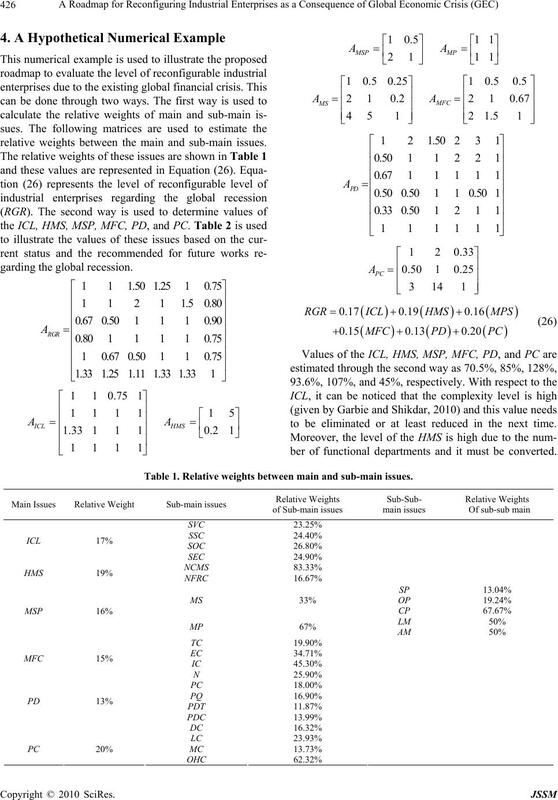 Values and percentages changes. sues and their parameters is oriented to specific solutions. lenge regarding th e financial crisis is also estimated. prises at any time cons idering the most important visions. fying the reconfigurable cost and time. cord, Vol. 261, No. 19, December 2008, pp. 56-59. China, September 2009, pp. 1-4. 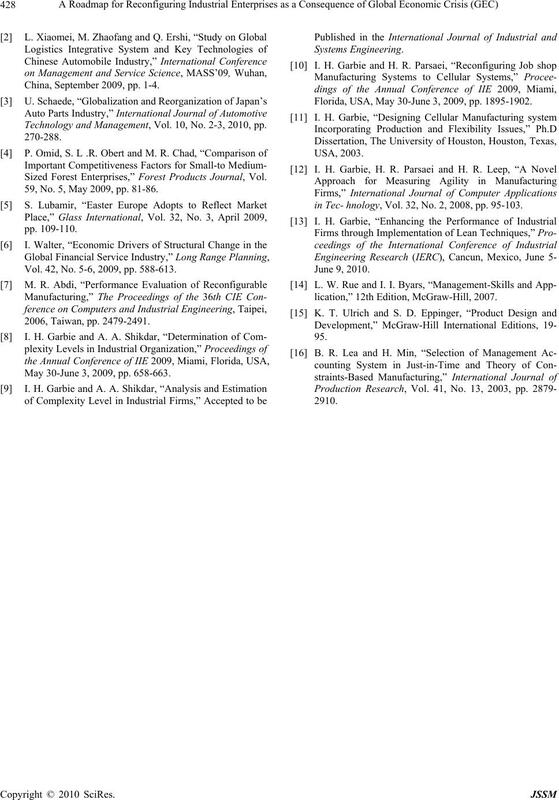 Technology and Management, Vol. 10, No. 2-3, 2010, pp. 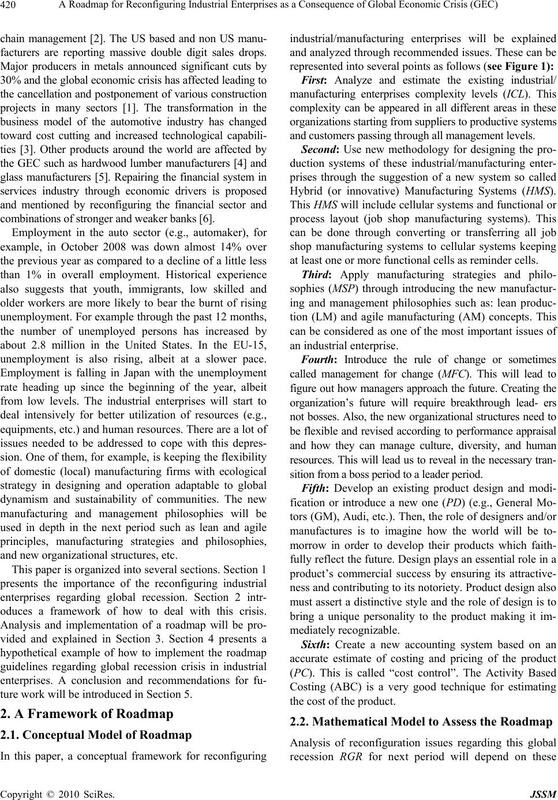 Sized Forest Enterprises,” Forest Products Journal, Vol. 59, No. 5, May 2009, pp. 81-86. Vol. 42, No. 5-6, 2009, pp. 588-613. May 30-June 3, 2009, pp. 658-663. Florida, USA, May 30-June 3, 2009, pp. 1895-1902.
in Tec- hnology, Vol. 32, No. 2, 2008, pp. 95-103.
lication,” 12th Edition, McGraw-Hill, 2007.